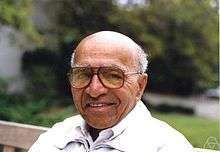 David Harold Blackwell (April 24, 1919 – July 8, 2010) was Professor Emeritus of Statistics at the University of California, Berkeley, and is one of the eponyms of the Rao–Blackwell theorem. Born in Centralia, Illinois, he was the first African American inducted into the National Academy of Sciences, and the first black tenured faculty member at UC Berkeley. Blackwell entered the University of Illinois at Urbana-Champaign with the intent to study elementary school mathematics. In 1938 he earned his bachelor's degree in mathematics, a master's degree in 1939, and was awarded a PhD in mathematics in 1941 at the age of 22, all by the University of Illinois. He did a year of post-doctoral studies as a fellow at Institute for Advanced Study in 1941–42. At the Institute, he met John von Neumann and von Neumann asked Blackwell to discuss his Ph.D. thesis with him. Blackwell, who believed that von Neumann was just being polite and not genuinely interested in his work, did not approach him until von Neumann himself asked him again a few months later. According to Blackwell on this meeting, "He (von Neumann) listened to me talk about this rather obscure subject and in ten minutes he knew more about it than I did." He departed when he was prevented from attending lectures or undertaking research at nearby Princeton University, which the IAS has historically collaborated with in research and scholarship activities. Seeking a permanent position, he wrote letters of application to 105 Historically Black Colleges and Universities; he felt at the time that a black teacher would be limited to teaching only at black colleges. He also sought a position at the University of California, Berkeley, and was interviewed by statistician Jerzy Neyman. While Neyman supported his appointment, race-based objections prevented his appointment at that time. He was offered a post at Southern University at Baton Rouge, which he held in 1942–43, followed by a year as an Instructor at Clark College in Atlanta. He then moved to Howard University in 1944 and within three years was appointed full professor and head of the Mathematics Department. He remained at Howard until 1954. He took a position at University of California Berkeley as a visiting professor in 1954, and was hired by UC Berkeley as a full professor in the newly created Statistics Department in 1955, becoming the Statistics department chair in 1956. He spent the rest of his career at UC Berkeley, retiring in 1988. Blackwell was also a pioneer in textbook writing and game theory. Blackwell wrote one of the first Bayesian textbooks, his 1969 Basic Statistics. Blackwell was also a member of Alpha Phi Alpha fraternity (Tau chapter – University of Illinois at Urbana-Champaign). 1 2 Sorkin, Michael (July 14, 2010). "David Blackwell fought racism; become world-famous statistician". Saint Louis Post-Dispatch. ↑ Roussas, G.G. et al. (2011) A Tribute to David Blackwell, NAMS 58(7), 912–928. ↑ Cattau, Daniel (July 2009). "David Blackwell 'Superstar'". Illinois Alumni. University of Illinois Alumni Association. pp. 32–34. 1 2 3 4 5 Grime, David (July 17, 2007). "David Blackwell, Scholar of Probability, Dies at 91". New York Times. Retrieved August 22, 2010. ↑ Gary Musser, Lynn Trimpe; Gary Musser; Lynn Trimpe (2007). Harold R. Parks, ed. A Mathematical View of Our World. Cengage Learning. p. 32. ISBN 9780495010616. ↑ Steven Krantz (2005). Mathematical Apocrypha Redux: More Stories and Anecdotes of Mathematicians and the Mathematical. Cambridge University Press. p. 225. ISBN 9780883855546. ↑ "Mission and History". Institute for Advances Studies. ↑ Blackwell's Basic Statistics inspired the 1995 textbook Statistics: A Bayesian Approach by the biostatician Donald Berry. ↑ University of California, Berkeley (2015), "List of recipients". Retrieved March 4, 2015. Dr. David Blackwell Biography Packet (5.21MB) provided by the Department of Statistics at the University of California, Berkeley.